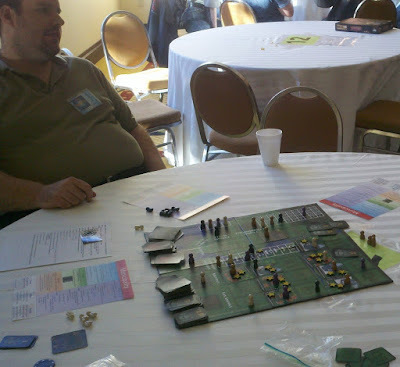 After the second seminar of the day, I rushed to grab my Municipality prototype and get back to the main game room. A publisher's representatives had made an appointment with me to check out Municipality at 1:00pm after seeing the reactions of the playtesters from the previous evening. After a few minutes of submission-form-filling and a rules explanation, we started playing. We didn't get through the entire game, as we had waited a bit for two of the players to arrive and bumped up against the 3:00 events, but they did manage to see a significant enough chunk of the gameplay to understand it and see what I feel are the game's strengths. When we decided to adjourn to speak about the game, all three players were positive about the game, two of them especially so. Most of their suggested changes were related to making the board clearer, ie. adding labels in places. The one real rules change they wanted was not allowing players to double their taxes when they are already at zero approval. I don't think it is a problem to allow it, but I also don't feel terribly strongly about that rule either, so I was prefectly happy to make that change. Other than that, they said that they were stretching to find things to change about the game. 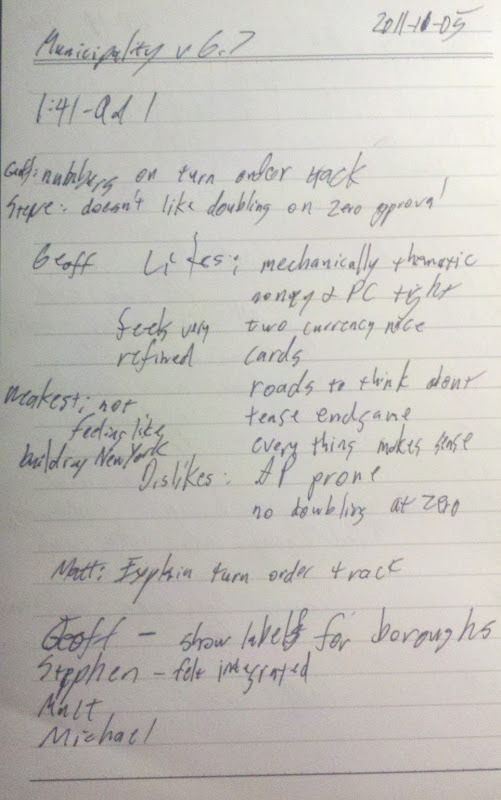 My full notes from the test are below (they're a bit sparse because I was also playing). However, since the convention, the publisher has expressed a desire to take a fuller look at Municipality. The publisher hasn't actually asked me to send the prototype over yet, but I assume that things will move forward once the Essen/Metatopia/BGG.con stretch of time is over. Up next: the toughest part of the convention - 6 more hours of playtesting without a break. I don't know about that rule change. It might encourage people to try to increase their multiplier sooner, but it might also make it really hard to get money, which is already kind of hard to come by. Also, aaaaahhhhh you put technology on your blog make it go away! (okay, so that's silliness, but seriously, this loads more slowly and is harder to use. I had some trouble figuring out how to add a comment. You don't like it? It's an experiment. It has some pluses, but you are right about the load times. I'll give it a couple of weeks and revert based on responses.